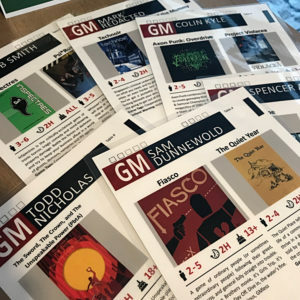 Would you like to come to Origins 2019 in Columbus, OH and run games for Games on Demand? We’re still accepting applications for volunteers and would love to have you join us! We are particularly interested in welcoming people of color, women, non-binary and LGBTQ folx as volunteers (and players) at our event, so please let us know if there’s anything we can do to help make that possible for you. PAX Unplugged is coming at the end of November in Philadelphia! Games on Demand will be there with more tables than ever and we still have room for volunteers. We’re looking for people willing to run games in 2 and 4 hour slots, Friday, Saturday, and Sunday. Based on the demand from last year, you’re practically guaranteed to have a table full of eager players ready to game! Whether you’re volunteering or playing, you’ll find us in Room 105B, the same space as last year. We’re open from 10AM-11:30PM Friday and Saturday, and from 10 AM-6 PM on Sunday! To sign up, join us on our Discord server, and check out the pinned information in the Unplugged thread. The 2018 Gen Con Games on Demand starts this week! We hope we’ll see you there, in our space at the Hyatt Regency hotel, third floor, Cosmopolitan ballroom B. Use the following map to find your way, and feel free to download and print copies to hand out to your friends! We’ll be running games starting at 10am on Thursday and ending at 2pm on Sunday. 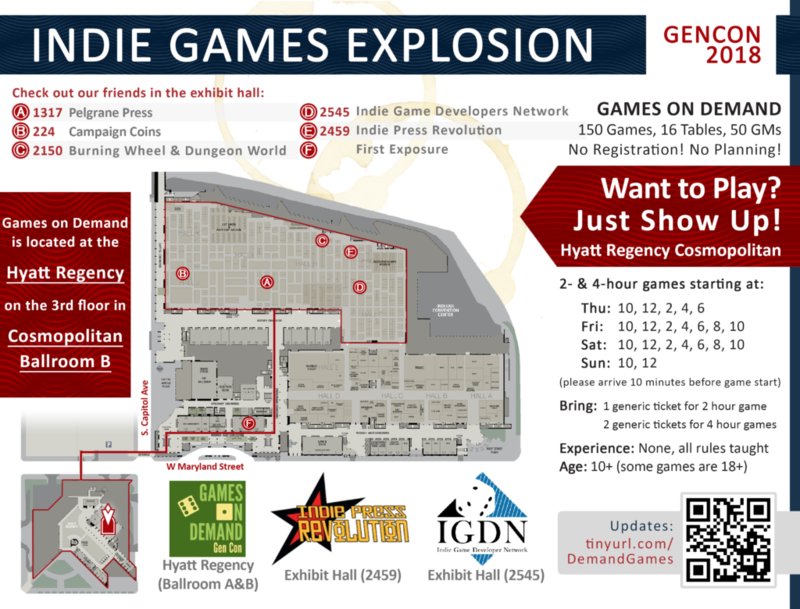 For full details about the Gen Con show runs, see gamesondemand.github.io. 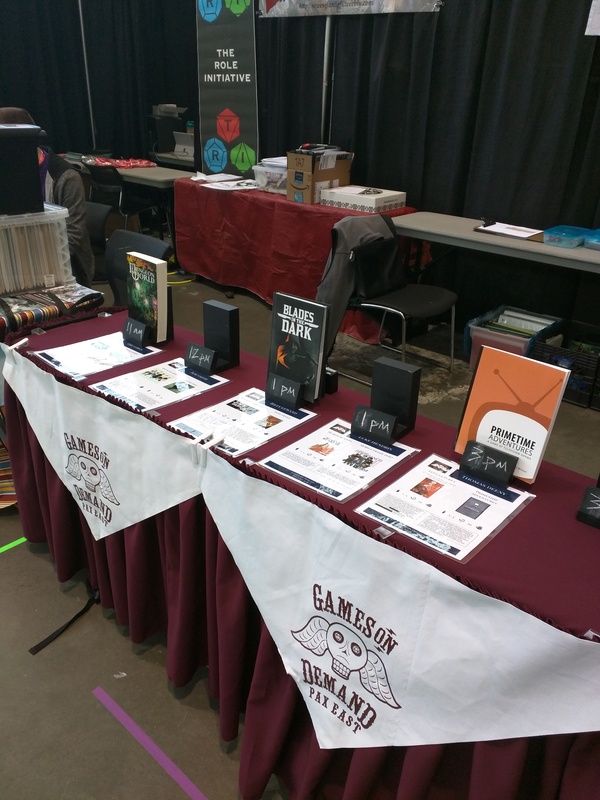 If you plan to join us at the show, or if you’re just a fan of Games on Demand and want to help out, we can always use donations to print materials and support our volunteers. You can send your contributions to paypal.me/GamesonDemand. If you’d like to know what games we’ll be offering, feel free to check out our tabletop and larp menus. Please note that these PDF files are pretty large! If you’ve been waiting for the opportunity to sign up for Gen Con Games on Demand, the time is now! This event will take place in Indianapolis, IN, August 2-5, 2018. We hope that you’ll join us and help to make this year our best event so far! PAX East is ready for battle. It’s that time of year again! Here is the form if you want to game-facilitate at this year’s Origins Games on Demand (Deadline: March 31st). This year’s theme is late 20th century Retrofuturism (think but not limited to; Cyberpunk, Satanic Panic, Tales from the loop, and retro tabletop gaming). If you run games in other genres we love you too and will schedule you, but we do want to promote this years theme. Please submit an event at https://www.neonri.com/index.php/contact/guest-event-form You will receive a GM badge for everyday to volunteer 4 hours or more, and access to the volunteer lounge.